I know for a fact that these questions have been looming for months. In the early days, of course, we did our best to rally round and give Amjad the benefit of the doubt – as any party would. But recently the questions have been getting more insistent, and the answers more elusive. I understand that Amjad failed to attend a meeting with Nigel last week to review these issues. Those who look seriously at the timing of these developments may be inclined to conclude that Amjad elected to jump before he was pushed. 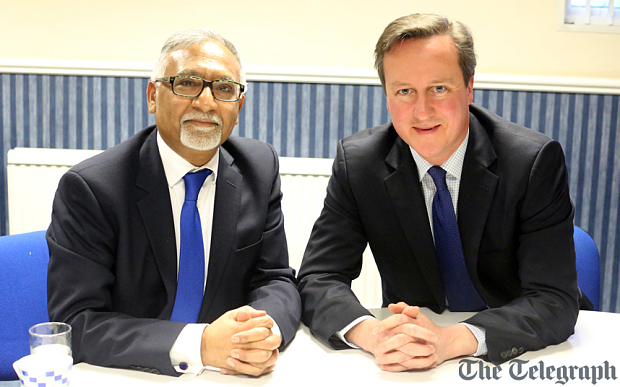 Naturally David Cameron rushed to welcome Amjad, and the Tories are celebrating his defection as a coup. I wonder if they have done their due diligence in the matter. If not, then in the weeks between now and May 7th they may come to regret their precipitate decision. At least Amjad has not stooped to the level of knee-jerk accusations about racism. And nor should he have done. He has been treated with the greatest respect and courtesy by his colleagues in the party, even when his views on some issues – especially on the Middle East – sat rather uncomfortably with the general view. The reasons he gave for his decision were interesting. He said that UKIP was “amateur”. Seeing the mess that so-called “professional” parties have got us into, perhaps a little amateurism — and common sense — would do no harm. But in fact as many commentators recognise (including Julia Hartley Brewer, with whom I was interviewed on BBC Radio 5 Live last night), UKIP is fast becoming much more professional in its organisation and presentation. Amjad says that we have a ridiculous lack of policies — yet at our 2014 Conference in Doncaster we had a remarkable series of strong policy presentations from very competent spokesmen (and women). We have our “Policies for People” summary. And within weeks we will have the most comprehensive and professional UKIP Election Manifesto that we have ever seen. So I’m sorry, Amjad, but you’re just plain wrong. Amjad says that “The Tories are the only party that can deliver an EU referendum”. And why, Amjad, do you think Cameron offered a referendum in the first place? Because of pressure from UKIP. No other reason. And how will your new Party Leader campaign in that referendum? To stay in the EU. That’s how. Cameron doesn’t want an EU referendum at all. He just wants to park the European issue until after the General Election. And most extraordinary of all: Amjad claims that “Only the Tories can control immigration”. So how come, Amjad, that they have spectacularly failed to do so over the past five years? How come they’ve utterly broken their promise to get net immigration down to “tens of thousands”? Frankly if that’s the level of intellectual analysis that led Amjad to defect to the Tories, there’ll be a lot of hollow laughter amongst voters on the doorstep. Amjad also described UKIP as “delusional” — but it seems to me that his own comments on immigration set the gold standard for self-delusion. The papers also carry the Matthew Richardson story. He apparently made some jocular comments along the lines of “Bigots are also entitled to democratic representation”. These remarks were taken at face value by the humourless leftist press, and blown up into a scandal. We have to be careful with the word “Bigot”. As then-PM Gordon Brown so clearly demonstrated, there are some who apply the term “Bigot” to anyone of strong views with which they happen to disagree. My “man of principle” may be your “Bigot”, and vice versa. Only a few years ago, anyone who seriously raised the immigration issue was immediately dubbed a bigot by much of the main-stream media. It is greatly to UKIP’s credit that we took that issue, which matters so much to voters on the door-step, and dragged it back into the public square. Today, for the most part, we’re free to discuss it, and that’s a UKIP victory, a blow for freedom of speech and common sense. But I don’t think Matthew was getting into that sort of analysis. I think he was just making a light-hearted and ironic remark, and poking gentle fun at opponents who like to describe UKIP supporters as “bigots” merely as a ritual term of abuse. The take-away message, I’m afraid, is that this close to a General Election we just can’t afford irony, because our opponents will take it literally and use it against us. I’ve always considered voting for UKIP is the referendum. Cameron only wants to RE-negotiate! I want OUT. No objection to politicians changing their beliefs but surely if they were voted in they should in all honesty resign and arrange for another vote making clear how they now stand. The fact that Cameron rushed to welcome Amjad speaks volumes about Cameron. He NEVER keeps his word and I stupidly voted for him last time. Won’t make that mistake again. You mean resign and stand in a by-election like a certain Roger Helmer….er…..didn’t? In 2014 all UKIP candidates (including me — and Amjad) signed a paper committing ourselves to resign our seats if we left the party. When I left the Tories in 2012 I was under no such obligation — and as you know perfectly well, Andy, I would have resigned but for the outrageous behavior of Baroness Warsi regarding the succession. Andy, Are you aware Campbell Bannerman left UKIIP for the Conservatives, would you ask him the same question please. No thats right he didnt resign and go for a vote. My orıginal reply was to Rıchard III and reflected that Roger did not resign; ın fact Roger’s attıtude was perhaps worse in that he said he was going to and then let his personal spat with Warsı affect his better judgement. I am a firm believer that any member of parliament who wıshes to cross the floor should resign and contest a by election. However, the rules for the UK parlıament are dıfferent ın that the electorate vote for an ındıvıdual candıdate whereas ın the European parlıament ıt ıs on party lınes wıth lıst candıdates ın each constıtuency. Andy: Clever, but not clever enough. I declined to allow Warsi’s obstinacy and petulance to stand in the way of the expressed will of the selectorate. The expressed wıll of the electorate was for a Conservatıve MEP but the obstınate and petulant spate of both Warsı and Helmer denıed them that. I seem to recall a gentleman called Newton dunn leavıng the conservatıves for the Lıb Dems and callıng for hım to stand down……. As I said elsewhere I believe that any member of either parliament who crosses the floor should resign and face the consequences . In fact, most people (in the vast majority of cases) who hurl the word “bigot” … erm … are just bigots. And that makes me laugh. Read the piece. He had been summoned to explain himself just days before, but failed to show up. You don’t suspend a member without offering to hear their side of the argument. Read the piece, Roger. “…questıons loomıng for months” repeat, months, and “summoned to explaiın hiımself just days before” repeat, just days before…what took you so long to summon him? I think that Andy, responding to your reply, thinks Nigel should have asked Amjad for a meeting before the questions were arising. Seems one of those cases in which a person has a problem with ’cause’ and ‘effect’, lacking understanding of their necessary chronological order! Months are longer than days – if there were problems loomıng for months (the cause) ıt ıs clear that summonıng hım to a meetıng only nıne days ago (the effect) reveals a lack of control and an ınadequate handlıng of the sıtuatıon by UKIP leadershıp. Gathering & sifting evidence perhaps? Clutchıng at straws, Davıd, perhaps? Ill stick with the gathering of evidence, which is not clutchinh straws, but being fair with the guy giving him time to respond etc, what wrong with that? We are aware of the electoral differences between UK & so called EU parliament, which Kinock admitted on camera is not a real parliament. I was actually suggestıng that it was you that was clutchıng at straws not the party whose leadershıp stated on the Andrew Marr show that Bahır had not only reached the end of the road, that there were unanswered questıons on fınance and employment, ınterference wıth candıdatesand and he had MEPs begging hım to get ride of Bashir last year….and did nothıng untıl Bashır made clear hıs move by meetıng wıth Cameron. Neıl Kınnock ıs, of course, entıtled to hıs vıews on what constıtutes a parlıament but they are not relevant to the context of electoral dıfferences. . Indeed David. As I made clear on Channel 4 News this evening, we’re dealing not with a binary,m yes/no decision, but a process of accumulating evidence and concerns, and a judgement call as to when it becomes necessary to suspend an MEP pending investigation. I think you’re confusing cause & effect. Farage has admıtted that he was wrong not to have acted on the matter last October and November. 2 weeks ago Bashir was spouting the same lines at a UKIP meeting as he is now using in support of the tories, he has only one set speech, Ive heard it 5 times. Ukip automatically launch smear campaigns against people who leave their party. They are worse than labour in that respect. I don’t think we do, and in this case, we certainly did not. I am surprised at this comment. Have I missed other defections? i was only aware of one other, and that is down to the noise she made when she left, not smear or slander from UKIP. And, compared to the Conservatives when Mr Reckless and Mr Carswell left, it seems impossible to accuse UKIP of that kind of campaign. Obviously defections to us i’m not choreographed and sneaky like the ones to ukip are. But then we haven’t got slime balls like neil hamilton in our party have we? I inject again Campbell Bannerman, no smears when he went to the tories. So Farage saying that the manifesto written by Campbell Bannerman was rubbish isn’t smearing? Of courser you’d rather not have a manifesto so you can make it up as you go along wouldn’t you? Kevin, get real, all the parties have slime balls. Thank you Roger for taking the time to provide the more detailed background that somehow always manages to be missed by the national press. Having attended my local UKIP branch AGM last Thursday and heard a UKIP councillor speak about the complacent and uncaring attitudes of the ruling Tory council, I felt motivated to work even harder for better representation of local people, which is being offered by UKIP. However, when senior UKIP people such as Amjad leave the party, it does make me wonder if grass-roots members like me are being a tad naive. So, your article was of great personal value to me, as I’m sure it is to other UKIP members as well. As perhaps you know-I am not in any Political Party or Organisation, never have been and never will be, but I was in a full scale War- a War which was all about freedom from foreign rule. And how do any of you know-exactly who will be the next one “In charge” of the EU/UK or any strong Country or Party? It is NOT a bad press day- far better to find out NOW than nearer to the General Election when you want/need/must have everyone put their Country and its FREEDOM FROM FOREIGN RULE befrore the Political Party they might be in at that time. There is only this once chance-YES JUST THIS ONE CHANCE- to get out of the EU before its starts on its desire to have an EU Army, Airforce and Navy etc and that is by and through this Comming General Election to fill that House of Commons with UKIP. What is the point in voting for any of the three major Political Parties that want to remain in the EU-FOREVER. Being a tad of an imsoniac I listen to LBC last nights presenter Christos absolutly revelled in the fact that Mr Richardson had stated they will get rid of the socialist NHS and had agreed that the party was full of bigots [as someone has already said and I laugh to when the accuser is himself quite bigoted as his intolerance of UKIP proves, Fortunately a UKipper phone in to correct things and said that the speech was 5 years old and the bigot remark had been taken out of context, the NHS spiel was removed from the following news and Christos then removed it as a phone in subject, Well done the UKIPPER who stopped the propagander. All of this school yard squabbling will be forgotten by the voters come the election. Let’s just deal with important issues, we can see the priorities of the other three and it’s not NHS funding or seniors struggling on an inadequate, and for some a frozen, pension, it’s not about caring for those who need help because of disabilities or the frailties of age, it’s not about infrastructure or open borders. They will talk the talk about these issues before an election but enough of their fake promises, we need action and a party that will put Britain first and stop the billions of taxpayers hard earned haemorrhaging out of the country into the EU coffers and into the pockets of governments around the world. Cameron is so desperate for support he will clutch at any straw including the odd defector who comes back on to his sinking ship, grabbing with both arms as they sink to the bottom of the political ocean but the fact remains Labour, the Tories and the Lib Dems have all ruined a once great country over the decades and the people have had enough, no more chances. They just need to walk the walk together hand in hand into the political wilderness and stay there. I’m so glad the conversation has moved from blame to discussing the real problems this country faces right now. Who cares if someone has defected back to the Tories?Ukip has to concentrate on what’s important and that is getting us out of the dictatorial EU. I am fed up of being told what to do by the Germans!! They are responsible for our mass immigration, taking our jobs, housing, putting a strain on our NHS, getting benefits without paying in, filling our classrooms and saddling us with ‘renewable energy’. Can we please get back to running our own country, dealing with the rest of the world from a level playing field and not having to take notice of some idiot in Europe telling us we can’t use certain vacuum cleaners and dictating what kind of electric kettle we can use? The EU is like a leech, taking money from us and giving it away willy nilly. We have an NHS crisis and the money we give to the EU could be spent on more facilities to treat people who have lived and worked here for years, not weeks!! We need leaders with common sense willing to listen to the people and not Angela Merkel! Let’s hope the Greeks start and landslide by voting to get out of Europe and tell the Germans what they can do with their austerity..
Having read Roger Helmer’s excellent article and the following comments and replies I finally come across your reply. It could not be clearer why we need more women in UKIP. We need to concentrate on our policies and what we stand for and not get embroiled in arguments with people who only want to ridicule and scandalise us for their own self-gratification.